Tripp Lite's TLP1008TELTV offers economical AC surge suppression for protection of workstations, PCs, telecom systems, home electronics and other sensitive equipment. 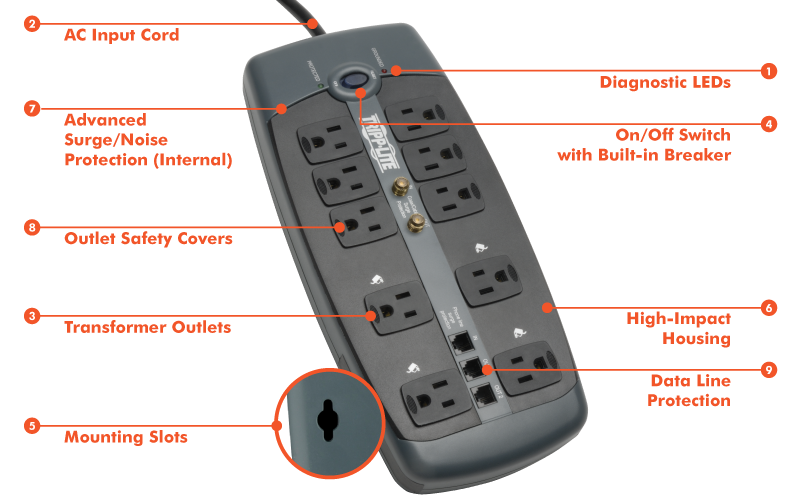 The TLP1008TLTV features 10 outlets, an 2.43 m (8-ft.) cord with a space-saving right-angle plug, and diagnostic LEDs to warn of suppressor damage. The unit has a surge suppression rating of 3345 joules to shield equipment from line noise and the strongest surges. Built-in RJ11 jacks prevent surges from damaging your modem/fax/phone equipment. Built-in 2.2GHz goldcoax jacks prevent surges from damaging your cable/satellite equipment. 3345-joule surge protection rating – More joules mean more protection!